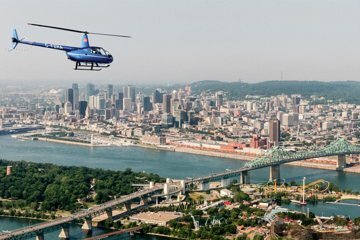 See Montreal from above on this helicopter tour of the city. During the ride, catch views of the Olympic Stadium, downtown Montreal, Mount Royal, and other sights as you soar at an altitude of 1,500 feet (457 meters). Before taking off, you’ll receive a safety briefing and be able to get comfortable with the aircraft. Totally awesome time with our young pilot, Kevin, in a personalized air tour over Montreal! Small and light chopper but with huge windows and an un-beatable view of the city. It's a bit of a ride out to the airport, so it might not work if you don't have a rental car (it's a long way for Uber...). Otherwise a great time. Worth the money!